Everything you do in your life influences your performance at work. Jennifer Bridges, PMP, shows you which work habits can propel you to success. It’s not just your choice of project management tools and productivity apps that affect your performance. Jennifer noted that what you do each day is going to have a direct impact on your work performance. That can mean anything, even what you do outside of the office. For example, what you read, whether you exercise, how you communicate with your peers, how you organize your workspace, what you eat, who you associate with and even your relationships. That’s a lot. In fact, that’s everything. Because how you live your life is going to influence how you perform, whether personally or professionally. There’s research that shows that your habits will impact how you perform. Jennifer looked up the habits of the most successful people in business and came up with this list. As an extra-tip, she said that the most successful CEOs are also in the relationship game. That is, they build strategic business relationships and nurture them. So, how can you apply those lessons to your own life? Jennifer has seven suggestions. Be Coachable: That means, don’t have thin skin. Seek help and take constructive criticism well. Don’t Gossip or Blame: Don’t speak ill of others, and especially don’t blame others when you’re at fault. Be a Problem Solver: No one likes a passive worker, so when there’s an issue, don’t wait for someone else to deal with it. Be Dependable: Nothing gets done if people can’t depend on you to be where you say you’ll be and do what you say you’ll do. Build a Buffer to Allow Time: You can’t predict how things are going to play out, so always give yourself a buffer of time to deal with issues as they arise. Be Prepared to Not to Know Everything: It’s the kiss of death to think that you know everything. Always strive to learn more, and never be so arrogant as to close yourself off to new knowledge. Use Your Phone Accordingly: It’s conventional wisdom that the smartphone is just the opposite: a distraction that stupefies. But there are times when it’s necessary to use it, and it can be helpful. To help you change your work habits, Jennifer suggested these seven tips. Treat as a Habit: That means you’re not going to suddenly find yourself changed overnight. What needs to happen is the creation of a plan with a goal, with a timeframe of three to four weeks, where you measure and track your progress as you go. Use Checklists: A great way to organize that plan is by placing the steps that will lead to your goal in a checklist. That way you don’t skip any, and you’ll find a great deal of satisfaction as you cross items out. Track Tasks with Software: You can see how much this is like any other project, and therefore that task list you’ve created will be easier to track by uploading it to your project management software. Engage an Accountability Partner: Software is fine, but it’s impersonal. It’s best to seek out a person who will spot you, like at a gym, and give you incentive and accountability to follow-through with your plans. Check-In: Structure your accountability partner by having weekly check-ins at their convenience to make sure you’re staying on track. Use Apps: In terms of, say, meditating, there are tons of mindfulness apps. Meditation comes in many forms, from guided to objectless, so find the one that works for you. Cancel Distractions: If you’re the kind of person who gets annoyed by noise and is constantly being distracted by others at work, then get a white-noise machine to cancel out those distractions in waves of calming drones. Pro-Tip: If you’re looking for more productivity tips to help strengthen your work habits, there are plenty of examples to find. Do some research, and remember, not everything works for everyone. Today we’re talking about “7 Work Habits You Need to Succeed.” Well, most of us have an idea of work habits we learned as children, but those don’t necessarily propel us to success. As a matter of fact, some people think only performance drives our success. But studies show that what you read, whether you exercise, how you communicate, how you organize, how you eat, and who you associate with, all have a direct impact on your chances of career success. These in essence are your work habits. There’s also a study that outlines the six daily habits of the world’s most successful CEOs, and I added an additional one. But they all get up early, they exercise regularly, they meditate daily, they cut back on meetings and organize the details, they don’t leave anything to chance, and they cultivate creativity. And the one that I added that I noticed in the ones that I study, is they build and nurture strategic business relationships. 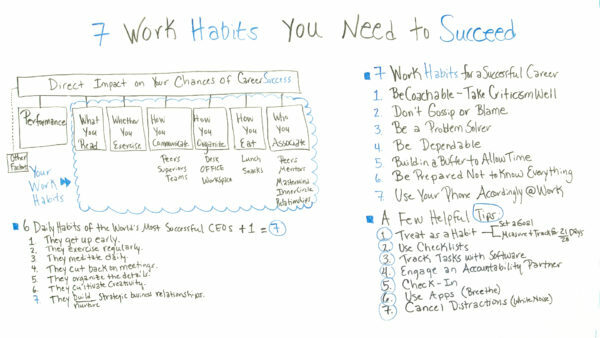 So there’s also another study that outlines 27 work habits for a successful career. So I picked out seven just for…just to name a few. So the first one is to be coachable, take criticism well. Well, some people talk about, well is it constructive criticism. Whether it’s constructive criticism or criticism and all, being able to take what information or feedback someone has given you, and take it back and really analyze and see how you can implement it, maybe changes to make your habits or your work better. The second one is don’t gossip about people. I took it a little further, I said, “Don’t blame people.” Really take responsibility and accountability for your own work performance. Number three, be a problem-solver. If something happens, then you take the ownership to solve or figure out what’s going wrong instead of looking for other people to solve it on your behalf. Also, be dependable. If you commit to something, really go to the steps of following through and following up until you get it done. Also build in a buffer and allow time for things to go wrong. Then be prepared to not know everything. So the most successful people I know, they are avid readers, they’re avid learners, they’re always developing themselves professionally and personally. Also use your phone accordingly at work. You’ll see some people who say, “Don’t use your phone in meetings.” Well, sometimes we have to use our phone in meetings. But it’s different if you’re reading social media, or maybe using Twitter or some other social channels while you’re being distracted during meetings. Because you can use it appropriately in the meetings to contact people, get information, or send information. So because these are habits and we know how hard it is sometimes to build and form a habit, I’ve given a few helpful tips. So number one, treat this as a habit. Again, it’s something that we’re trying to put in our schedule and do regularly and consistently. So set a goal and then measure and track it for 21 days. Some people say 21 days, some people say 28 days, I say 28 days because it just gives me more time to get something in a routine. Use checklists. Checklist helps me for things that I’m trying to learn to do. I make a checklist and I make sure that I’m doing things on that, the items on the checklist. Also track your tasks with software. So software today it can go with us on our mobile phone, on our mobile devices, and it sets for reminders or triggers that can help us to remember to do things. Also engage an accountability partner. So I think this one and then doing check-ins is part of why something like a Weight Watchers work, right? So they have accountability partners and they have weekly check-ins. So that helps to just have somebody, like if you come into like you meet a barrier of why you can’t get something done, it always helps to have somebody to help you work through those issues. Then number six is use apps. So when you’re talking about meditating or some kind of productivity, there are just great apps that you can download. There’s one that I use for a meditation it’s called “Breethe” and it just, you know, from…in my work day or if I need to relax then that helps. And then also cancel distractions. So there’s another app that I like it’s called “White Noise.” So if I’m somewhere working, I’m usually working in a remote location with a lot of people and a lot of distractions then that…put my headset on and that cancels out the distractions. So these are just a few work habits and a few tips that can help you with your career success. And if you need a software tool that can help you with your work habits, then sign up for our software now at projectmanager.com.